Two U.S.-built communications satellites for Dish Network television subscribers and Indonesian banking customers fired into orbit from French Guiana aboard an Ariane 5 rocket Saturday, setting the record for the European launcher’s heaviest commercial payload. The two spacecraft fastened inside the Ariane 5’s nose cone — EchoStar 18 and BRIsat — had a combined weight at liftoff of 21,693 pounds (9,840 kilograms) stacked on a Sylda dual-payload adapter. When figuring in the mass of the Sylda adapter structure, the mass allocated to the Ariane 5’s payload Saturday summed 23,657 pounds (10,731 kilograms). 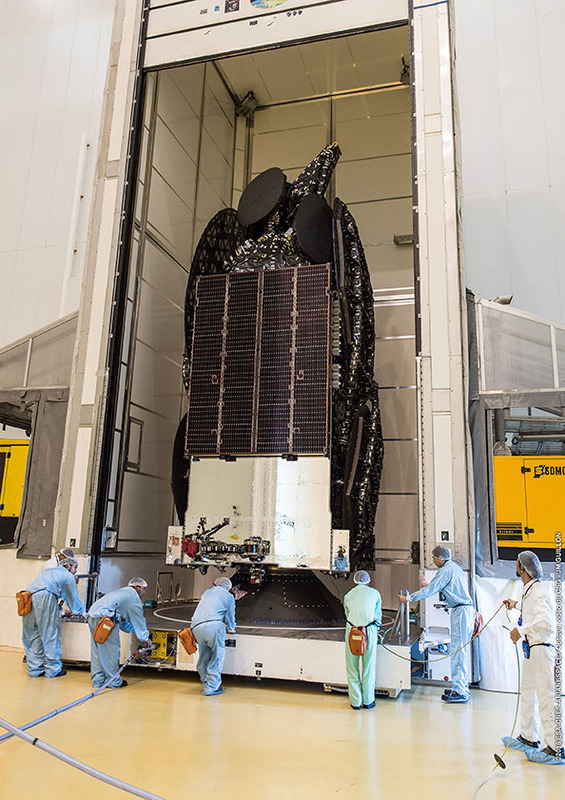 It is the heaviest combined commercial payload ever launched on an Ariane 5 rocket, eclipsing a previous mark set in 2013, and it is the most massive satellite package ever put into geostationary transfer orbit, a drop-off point for most large communications satellites. 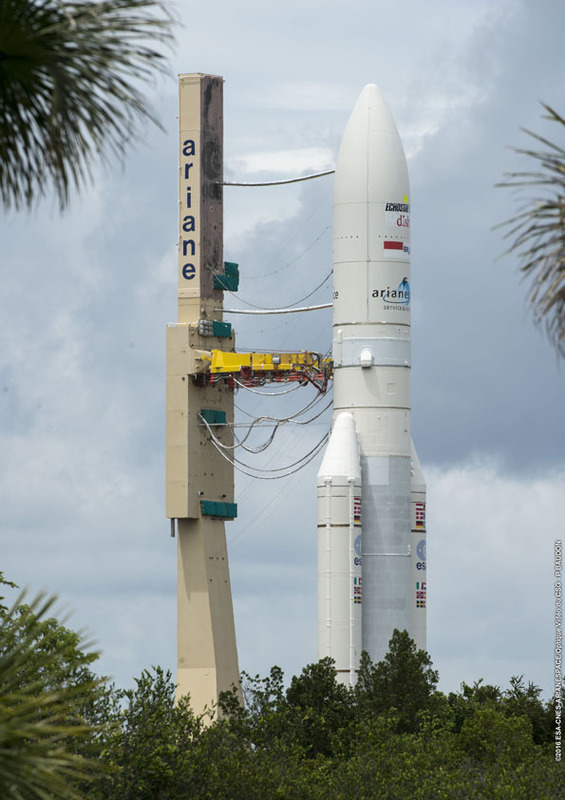 Delays caused by issues with fluid and umbilical connectors pushed back the Ariane 5 launch from early June, and unfavorable high-altitude winds kept the rocket grounded Friday. Saturday’s conditions were better, but a problem with a valve on the rocket’s hydrogen-fueled first stage delayed liftoff more than an hour until near the end of the launch window. Members of the launch team finally declared they were “go” for liftoff, and the countdown resumed. The Ariane 5’s liquid propellant tanks were pressurized for flight, and the rocket’s first stage Vulcain 2 main engine fired at 2138:32 GMT (5:38:32 p.m. EDT) as the clocks reached zero. 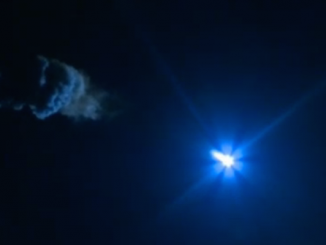 Seven seconds later, after the Vulcain main engine passed a computer health check, the Ariane 5’s twin solid rocket boosters ignited with a thump of sound, propelling the 180-foot-tall (55-meter) rocket into the sky over Kourou, French Guiana, a few minutes before sunset. Riding 2.9 million pounds of thrust, the Ariane 5 climbed through scattered clouds backdropped by an orange sky, soared into the upper atmosphere and dropped its two solid rocket boosters less than two-and-a-half minutes into the mission. A nose cone covering the EchoStar 18 and BRIsat satellites jettisoned about a minute later, and the Ariane 5’s first stage Vulcain 2 engine shut down about nine minutes after liftoff as the rocket streaked across the Atlantic Ocean at hypersonic speed. The HM7B engine powering the rocket’s upper stage took over to accelerate the launcher and its satellite passengers to nearly 21,000 mph (about 9.3 kilometers per second). The 13,889-pound (6.3-metric ton) EchoStar 18 spacecraft separated from the Ariane 5 launcher’s upper position about 29 minutes into the flight, followed at the 42-minute point by deployment of BRIsat from the lower berth of the rocket’s dual-payload holder. “Arianespace is delighted to announce that EchoStar 18 and BRIsat have been separated as planned in the targeted standard geostationary transfer orbit,” said Stephane Israel, chairman and CEO of Arianespace, in post-flight remarks at the Jupiter launch control center in Kourou. The mission aimed to put EchoStar 18 and BRIsat into a geostationary transfer orbit ranging in altitude from 155 miles (250 kilometers) to 22,224 miles (35,766 kilometers), with an inclination of 6 degrees. With Saturday’s success, the Ariane 5 has logged 72 flawless flights in a row since 2003. Arianespace officials touted engineering efforts to grow the Ariane 5 rocket’s capacity over the last decade, with the launcher’s current Ariane 5 ECA version now able to lift more than 3,000 pounds (1.4 metric tons) extra payload to geostationary transfer orbit than possible on its first mission in 2002. “With the support of ESA and with the support of CNES (the French space agency), and in partnership with our prime Airbus Safran Launchers, further activities are already underway to increase this performance step-by-step by about 300 kilograms (661 pounds) in 2018,” Israel said. Most of the performance improvement has come from refining design constraints on the rocket as engineers gain comfort with the Ariane 5’s extensive flight history. The Ariane 5, one of the most powerful rockets in the world, normally carries two communications satellite in one launch, allowing customers to share the cost of the flight to make the launches affordable in the commercial market. EchoStar 18 and BRIsat, both made by Space Systems/Loral in Palo Alto, California, will use on-board engines to raise their orbits to a circular path around the equator at an altitude of more than 22,000 miles (about 35,700 kilometers), where each craft’s speed will match the rate of Earth’s rotation. 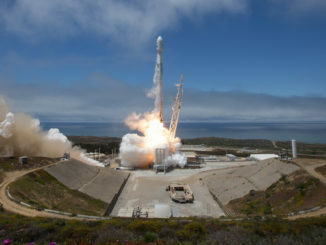 The satellites quickly began communicating with ground controllers at Space System/Loral’s control center in California, according to David Pidgeon, executive director for EchoStar programs at the satellite manufacturer. “That means those satellites are in the right place, and they’re streaming and operating just like they’re intended to do,” Pidgeon said. Dish Network customers across the United States will receive television signals broadcast from EchoStar 18 during its 15-year lifetime. 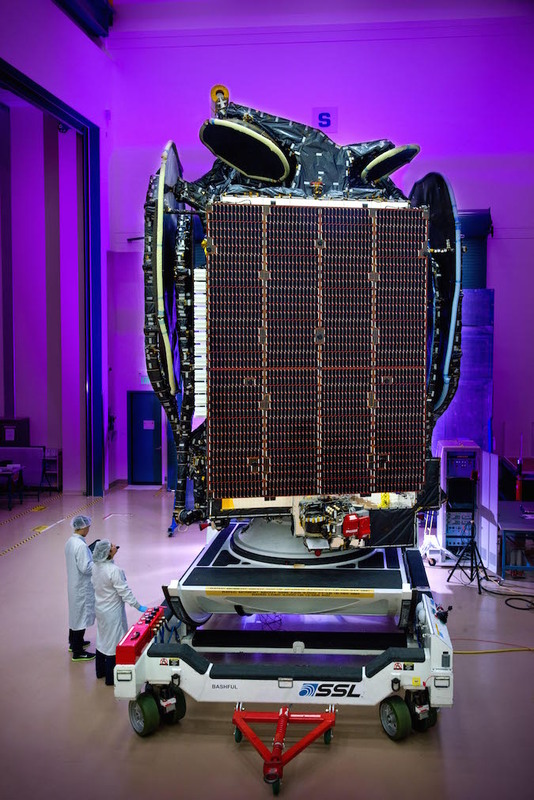 EchoStar 18 extended its solar arrays to a span of more than 106 feet (32 meters), and started maneuvers to circularize its orbit to geostationary altitude, Space Systems/Loral said. The spacecraft is heading for an operating position along the equator at 110 degrees west longitude. The new spacecraft is also the first in Dish Network’s fleet to have coverage of Cuba. Initially expected to serve as a spare, EchoStar 18 will eventually replace Dish Network’s EchoStar 10 broadcast satellite launched in 2006 by a Sea Launch Zenit 3SL rocket. BRIsat, the other payload on Saturday’s mission, is heading toward a parking slot in geostationary orbit at 150.5 degrees east longitude. “With the launch of BRIsat, we are proud to be the first and only bank in the world to operate a satellite,” said Asmawi Syam Syamsuddin, CEO of Bank Rakyat Indonesia, BRIsat’s owner. “It’s not only a proud moment for BRI, but also for our country, Indonesia. 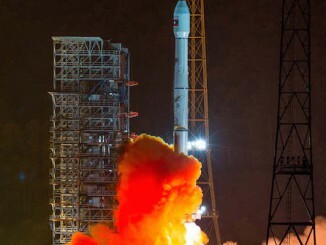 The 7,804-pound (3,540-kilogram) BRIsat satellite hosts 36 Ku-band and nine C-band transponders, according to Hexana Tri Sasongko, the satellite’s project director at BRI. The craft will expand secure banking communications to almost 60 million customers across the Indonesia archipelago, including locations where banking services were previously unavailable, according to BRI. Space Systems/Loral, which built the BRIsat spacecraft based on the company’s 1300-series satellite platform, said the Indonesian banking platform was healthy after Saturday’s launch and extended its power-generating solar panels. 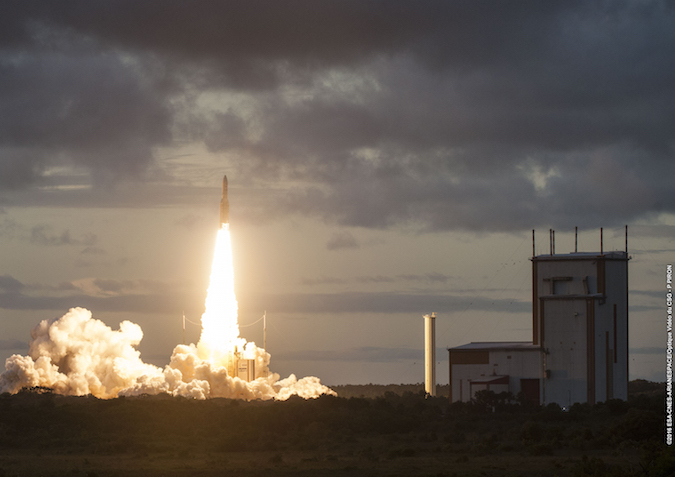 Sunday’s launch was the fifth Arianespace mission of 2016, and the third by Ariane 5. The French company’s next mission is set for Aug. 24, when another Ariane 5 will lift off with two communications satellites for Intelsat.